After using two soil samples to scour away any earthly contaminants from inside the Curiosity rover's sample acquisition system, a third scoop of fine-grained martian soil was dumped into an on-board laboratory instrument Wednesday for the mission's first detailed "hands-on" mineralogical analysis, the project scientist said Thursday. 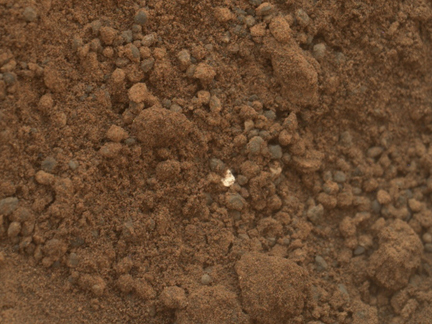 The process took a bit longer than expected because of work to make sure an unusual shiny fragment seen in the darker soil near the scoop site was not "foreign object debris" from the rover that could affect the analyses or operation of the rover's two laboratory instruments, the Chemistry and Mineralogy, or CheMin, experiment and the Sample Analysis at Mars, or SAM, experiment. The CheMin instrument uses X-ray diffraction to identify minerals in soil samples while SAM uses a suite of spectrometers to study the chemistry of both soil and air samples. 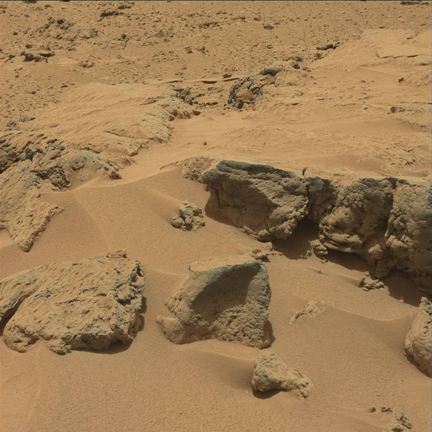 Curiosity currently is parked near sand dunes in an area dubbed Glenelg, using a scoop on the end of its robot arm to collect the initial soil samples for detailed analysis. Two scoops were collected, dropped into the sample handling system and then vibrated to "clean" the walls of the system and remove any lingering traces of earthly contaminants. 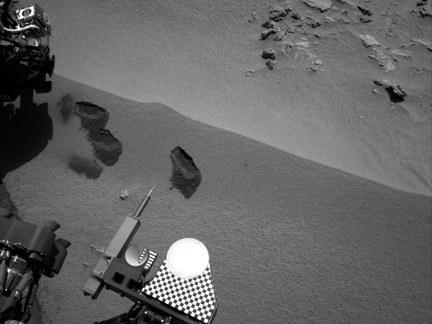 It was during the second scoop acquisition that scientists noticed an unusually bright fragment in the soil near the rover. John Grotzinger, the Curiosity project scientist, told reporters the 1-millimeter-wide fragment "is something that's unusual." "You see a spectrum of these things," he said. "The question is, how to know that you're actually sampling it? That was our original fear, was that if something like this turned up and it was manmade and we put it into the funnel that goes down into either the CheMIn or the SAM instrument, what would be the consequences of doing that?" But after a detailed analysis, Grotzinger said the science team was in general agreement that the fragment was a natural component of the martian soil. "There are two preferred hypotheses," he said. "There are certain classes of minerals that have what we call cleavage and if somehow during the scooping process you broke one of these minerals along its cleavage plane, then you would get a nice flat surface that might reflect the sunlight and it would be free of dust, and that would make it bright. "A second option is that maybe there's a process that's occurring in the soil that results in the generation of minerals that are basically a part of the soil-forming process. In either case, we very much would like to study this." To help confirm the true nature of the fragment, Curiosity will be repositioned so another instrument can hit the fragment with a laser beam. The Chemistry and Camera instrument, known as ChemCam, will vaporize a small segment of the fragment, producing debris that will be analysed by a telescopic spectrometer. "Whatever it is seems to be very uncommon," Grotzinger said. "We don't want to make any mistakes, but on the other hand we do have a plan to execute. ... I would say it's a strong consensus that this is something natural and probably represents a scientific opportunity rather than an engineering threat." About two weeks ago, photos from Curiosity showed what appeared to be a small piece of debris that did, in fact, come from the lander. At the time, engineers speculated it may have been a bit of plastic from a cable tie or some similar bit of material. Project Manager Richard Cook said Thursday about a half-dozen such bits of debris have now been seen, ranging in size from 10 to 20 millimeters long. While engineers don't yet know what the material might be, the rover is operating flawlessly and they speculate it may have come off during Curiosity's rocket-powered sky crane landing Aug. 6. "We don't know whether or not they're plastic or they're something else, nor do we understand the source of them," Cook said. "It is worth pointing out that as the vehicle is landing and the various things separate off the vehicle, there's lots of debris generated and it falls wherever it falls. On (earlier landers), for example, we certainly saw evidence of that kind of debris at various spots and there's no reason to believe we wouldn't see that this time as well." Grotzinger said Curiosity remains roughly on schedule with a full slate of science activity planned for Glenelg. If all goes well, the rover's power drill will be tested next month and by the end of the year, Curiosity should be on its way to the foothills of Mount Sharp, a towering three-mile-high mound of layered rock at the center of Gale Crater. "We feel very good about how everything is going," Grotzinger said. "It's really remarkable that we've had no serious issues at all and what's around us, we're very excited about it. We look at the images and we see things that promise a lot of excitement in terms of understanding the environmental history of Mars and maybe giving us further clues" as to whether Mars ever hosted a habitable environment.